In today’s society, not all families are the same. What was once considered a typical American family – Mom, Dad, two kids and a dog – is no longer as common as it once was. Additionally, life expectancy has increased. Because of these reasons, Multi-Generational House Plans are growing in popularity throughout the United States and Canada. What is a multi-generational house plan? It is one home structure designed for multiple generations with separate living units. This arrangement provides privacy and independence for two or more generations all under one roof. With multi-generational house plans, the exterior looks like all the other houses in any neighborhood; it looks like a single-family home. The separate living units are not noticeable on the outside like they are with duplexes, townhouses and other multi-family designs. Instead, multi-generational house plans incorporate a separate living unit into the floor plan that provides private spaces for independent living while still being connected to the main house. Most of these units feature a private entry kitchenette, small living area, bedroom and bath. The laundry area and garage may be shared with the main house or they may be separate. While most multi-generational house plans incorporate the separate living unit on the main level of the home, it is important to note that sometimes the separate unit is located above the garage or in the basement of the home. Who would benefit from a multi-generational house? Now days, no two families look the same. Instead of downsizing, some baby-boomers are trading up for larger homes that will allow their aging parents or other elderly relatives to live with them, as well as, their adult children who have recently graduated from college and need a place to get on their feet while they begin their careers. Adult children and grandchildren are moving back home with to live with parents and grandparents due to financial situations. In other cases, grandparents are raising their grandkids. No matter what combination of multiple generations live under one roof, it is easy to understand how a multi-generational house plan can provide the living space everyone needs. 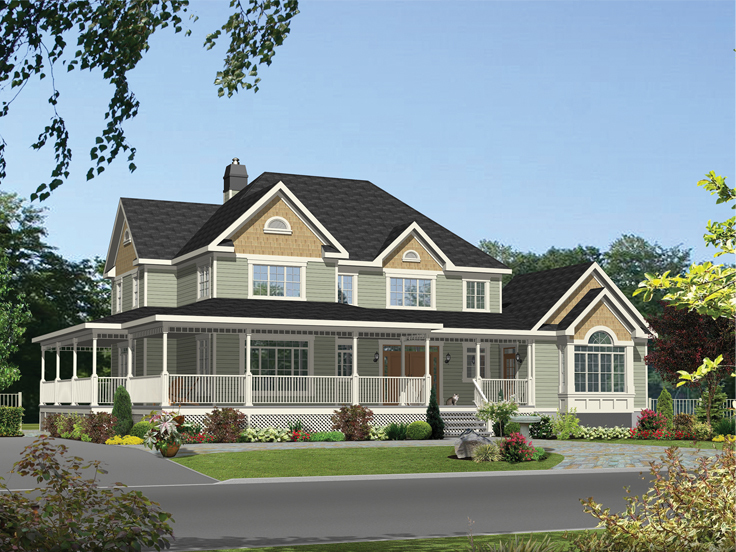 Are multi-generational house plans practical? Yes! They are practical for countless reasons. Consider the following examples, and you’ll see that a multi-generational house certainly has its advantages. Multi-generational house plans are cost effective in areas with a high cost of living such as California. In this situation, parents and their adult children can pool their incomes and finances to go farther. It provides an opportunity for the adults to live independently but together when they might otherwise be scraping up pennies to pay the rent or live in a lower income area or less desirable neighborhood. In cases like this, a multi-generational home is a financial solution. For baby boomers, a multi-generational house plan allows home owners to keep an eye on aging parents/relatives who are able to live independently, but sometimes need a little extra assistance. It offers peace of mind and a little extra security. In other instances, multi-generational houses plans deliver a great alternative to paying monthly fees charged by assisted living facilities. As more and more families try to figure out how add on to their homes to make room for Grandma or Grandpa or how to make ends meet while paying for assisted living for a loved one, the option of building a multi-generational house becomes a more feasible and affordable idea. Sometimes two-parent and single-parent families need assistance from Grandma and Grandpa when it comes to child care. Again, a multi-generational house is a viable solution. The grandparents can take care of the grandkids while the parent(s) are at work. In the evening and on weekends, the grandparents can retreat to their private suite. Additionally, the grandparents are able to participate in their grandchildren’s lives on a daily basis. They won’t miss birthdays, ball games, etc. This arrangement can develop a stronger bond between grandparents and grandchildren that might not otherwise be possible if the grandparents were living across town, in another city, etc. Some multi-generational house plans offer a separate living unit in the basement of the home or a small apartment above the garage. These units are ideal for college students and recent graduates who are trying to save money for their own home but need to get their careers started. Every now and then, the young adult might need guidance from parents or grandparents, but for the most part, he or she wants to live independently. Multi-generational houses are great for resale. As the “family unit” continues to evolve, more and more Americans will find themselves in a multi-generational household. When the time comes to down-size, your multi-generational house is sure to appeal to another multi-generational family. For those currently living in a home with multiple generations of family members, a multi-generational house plan can change your life and your lifestyle. Allowing each generation of the family unit to have its own space will minimize friction, promote positive family experiences, and help to curb financial stress.